I live near the Pacific, along highway 1, which winds along the length of California (mostly). Two days ago I was riding my bicycle along a coastal path around noon, when coming around a curve in the opposite direction was this apparition. Hey, it was a yellow tandem bike. No there’s more than two. Wait, there are kids. Little kids. Whoa! There are five people riding. Add luggage! They were obviously on long trip but they went by pretty fast, and I did not have a camera. So I googled them. Found their blog. Their story is even more amazing. With gear their bike weights 600 pounds. They’ve ridden 4,000 miles so far and are headed up the coast to Alaska. They left their home in Kentucky with $300 in their pockets. 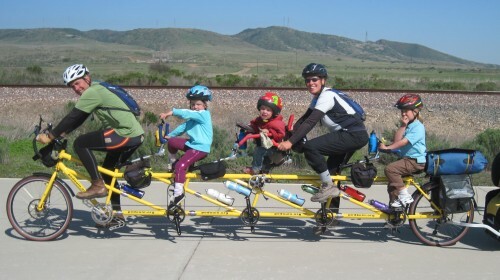 I rode my bicycle across the country once so I know what is involved and man, those kids must be amazing. According to their facebook account, they are scheduled to cross the Golden Gate Bridge today at 10 am. That would be a photo opp. Thanks Kevin, This made my day! There web site is very inspiring about the giving nature of the USA. I am 45 and wish they would adopt me. Too much fun for just 5. BTW, those parents must be more amazing. I’m going to spoil the party and suggest that riding to Alaska is a great way for an adult to choose to spend their time, not a great way to raise a child. For one thing, neurologically, children are rapidly developing areas of the brain vital for social skills and emotional regulation. Staring at someone’s back won’t be helpful, being unable to have physical contact won’t be helpful, being restricted in the play that fosters so many other skills won’t be helpful. We can imagine various ways they might be overcoming these challenges, I imagine they are well intended, but I think the kids could have benefitted from a different adventure strategy. @MT: I am curious what kind of long-term adventures you did, or do, with your kids that you found more stimulating and beneficial to them than a bike ride across a continent? I almost laughed out loud when I read your comment, I thought it was a joke When I saw you were serious I thought it actually was a great example of the “Parents Magazine” and child-developmental research parenting culture that seems to have saturated our society. I have 5 kids, we home school, and I can tell you unequivocally, what these parents did (and are doing) for their kids is a priceless treasure in their development that could never be repeated by attempting to optimally stimulate “social skills and emotional regulation.” Instead of creating a child development lab in our schools and in our homes, constantly having thumb in the wind to the latest contradictory research and theories, more than a few kids could benefit from simply getting out in the world and experiencing life.